Speaking via video link from Brussels former Catalan President Carles Puigdemont has launched his party's Catalonian election campaign. 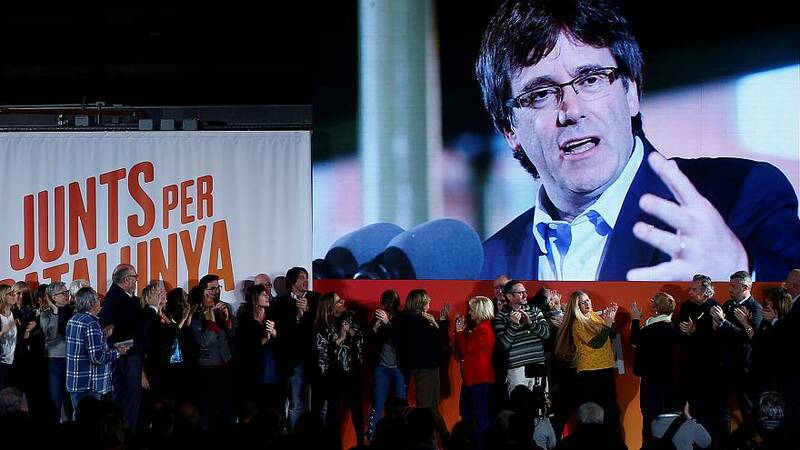 He was cheered by thousands of people who gathered in the absence of the party's main candidates who are in Spanish jails or, like Puigdemont, abroad. "The most direct way for them to understand what the vote means is to tell them that it is the second round, at 1-0. Or did they think we would not remember? They thought we would not remember police violence?" he said. His allies in coalition have been the Republican Left of Catalonia, and latest polls put them neck and neck with Puigdemont's CiS, but they are under pressure from Podemos on the left. So much for the separatist camp, but those wanting to remain Spanish are determined they will not have it all their own way, Centrist newcomer Ciudadanos is confident it can prevent a majority voting for independence. "Catalans are positioning us as an alternative to separatism, it is a very important campaign. If the process is finished, a stage of tranquillity, hope and reconciliation will be opened, otherwise we will continue in this situation for four more years and Catalan society can not stand four more years of division," said party leader Albert Rivera. Catalans have plenty of local parties to choose from, along with the local branches of the big national parties, and opinion polls suggest that fragmentation will not make securing an absolute majority easy for the separatists. "This is the start of a crucial election for Catalonia, Spain, and the EU. Opinion polls say the pro-independence and constitutionalist blocs are about equal. The parties will try to tilt the scales between now and December 21st," reports euronews' Cristina Giner.